Sen. Art Linares, R-Westbrook, who is a co-chair of the higher education committee, spent an hour asking questions and voicing concerns about the Dreamers’ bill Friday night. A years-long campaign to allow undocumented students to receive financial aid at Connecticut’s public colleges almost certainly will not achieve its goal this year, and its future chances are in doubt. The Senate held a symbolic debate for nearly two hours early Friday evening before tabling a bill that would have given undocumented students access to the $165 million pot of institutional financial aid at public colleges in the state. The students currently contribute to the aid money through their tuition payments. The bill had passed the Senate with bipartisan support in each of the past two years. “I think that was our shot at it” for this year, said Sen. Beth Bye, D-West Hartford, who is one of three co-chairs of the General Assembly’s higher education committee. The so-called Dreamers – advocates of the legislation – had been making a late push for a Senate vote after progress in the House was undone by the arrest of Eric Cruz López, one of the group’s leading activists. Cruz López was charged with 103 counts of criminal mischief involving politically motivated graffiti painted at the University of Connecticut in Storrs, where he was a former student. Rep. Gregg Haddad, D-Mansfield, also a co-chair of the higher education committee, said the House was “one or two” votes away from passage – but, he said, it “needed Republican support.” That support dissipated after Cruz López’s arrest. The bill’s long-term prospects are now in question. 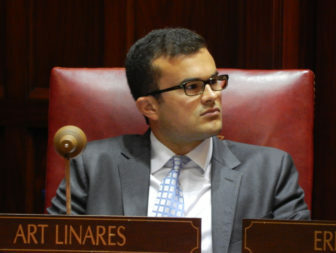 Sen. Art Linares, R-Westbrook, the lone Republican co-chair of the higher education committee, spent an hour on the Senate floor voicing his concerns about the legislation, saying he was “conflicted.” He said he thought it was “an important debate to have” this year. 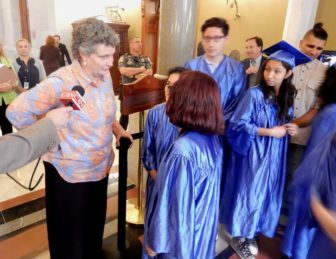 Sen. Beth Bye talks with Dreamers last week outside the Senate chamber. Looking ahead, however, Linares said later that the state’s fiscal challenges and business climate should be the legislature’s top priorities in years to come. “You do some policy; you do some budget,” she said. Haddad said he feels “very strongly” about bringing the bill back in 2018. Advocates of the legislation said this session was “ideal” for their effort and haven’t given up yet. Haddad said its prospects in the session’s remaining days are dim.